More than 46 million Americans will travel further than 50 miles for this week's turkey-based festivities, and many of us will do it via air. And while very few airports deal well with holidays swarms, some of them excel at misery. 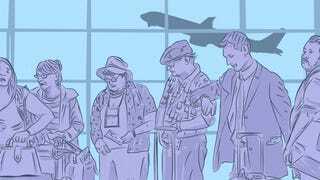 Last month, we set out to find America's worst airport. We asked you to name your least favorite terminals, and amassed over 600 comments. The debate was contentious and there was no clear victor. So we asked you to vote on the eight most-mentioned airports. Keep in mind, this is in no way Empirical, since these were based on your informal suggestions and, of course, aren't adjusted for the size of the airport and other influencing factors. Still, it's been a fun way to channel our collective rage, and now, many thousands of votes later, we have some winners (losers?). In our original post, Kansas City featured prominently in the comments—your horror stories were rich and vivid. Yet it seems like KCI wasn't able to harness the support it needed in the final, with only 431 votes. Sorry, Kansas City. Or, congrats, I guess. Dulles was another crowd favorite that managed to dredge up just 468 votes in the final. What happened? Maybe some last-minute sprucing of the terminals? Or perhaps fliers finally looked around and noticed the lovely Eero Saarinen-designed architecture? By now you're noticing a trend here: The smaller airports, Philly included with only 677 votes, just don't have the manpower to get this thing done. Not enough people pass through them to gain a foothold in this contentious race. Hundreds of commenters condemned Atlanta in our first post, but nearly as many of them defended it. That helps to explain why the biggest airport in the world only managed 688 votes—a vocal minority, meanwhile, were very angry about it. You might hate Newark, but you probably hate getting to Newark more than the airport itself. Or so out poll suggested: The hatred for EWR was lukewarm at best, amassing only 770 votes. Now we're getting into the real competitors. O'Hare, though it has fantastic public transit and generally good food options, was condemned with 981 votes for everything from the distance from terminal to terminal to the frequency of its weather delays. The scorn demonstrated by our commenters for LAX was fiery and bitter. From the design to the food options, there was nothing but rage for this airport. One commenter even uploaded a picture of his name written in the dust at one restaurant. Still, 1,185 votes weren't enough to take the crown. The airport that one commenter lovingly described as the "75-year old loaded diaper known as LaGuardia" won by a landslide in the finals with 1,651 votes. Not only does Biden hate it with a passion, Cuomo is throwing money at designers looking for ways to fix it and its peers.